Ambassador Miroslav Lajčák is a Slovak diplomat, former Director-General for Political Affairs in the Slovak Ministry of Foreign Affairs before becoming High Representative and EU Special Representative. He has extensive experience in Southeastern Europe where he was known for his role as mediator and personal representative of the EU High Representative for the CFSP, Javier Solana, in Montenegro in 2006, overseeing the Montenegrin referendum in this capacity. Between 2001 and 2005, Ambassador Lajčák was based in Belgrade as Slovakia’s Ambassador to the Federal Republic of Yugoslavia, Albania and the Former Yugoslav Republic of Macedonia. From 1998 to 2001, he was Head of cabinet of Slovakia’s then Foreign Minister, Eduard Kukan. Between 1999 and 2001, concurrently, he was Special Assistant to Minister Kukan in his capacity as Special Envoy of the UN Secretary General for the Balkans. Ambassador Lajčák was Slovakia’s Ambassador in Japan between 1994 and 1998. Between 1991 and 1993, Ambassador Lajčák was posted to Moscow. Ambassador Lajčák is a law graduate from the Commenius University in Bratislava. He studied international relations at the State Institute of International Relations in Moscow and is also a graduate of the George C. Marshall European Center for Security Studies, Garmisch-Partenkirchen, Germany. 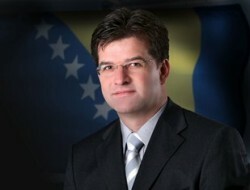 Ambassador Lajčák is fluent in Bosnian-Croatian-Serbian, Bulgarian, English, German and Russian.